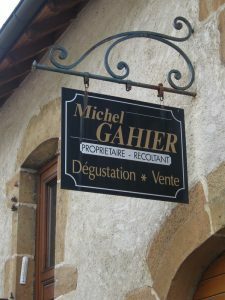 Michel Gahier lives in the centre of the village of Montigny-les-Arsures which lies near the central town of Arbois. The reason this is significant is that Montigny is regarded as the finest terroir for the Trousseau grape in the Jura. When we first tasted his wines we were very excited by their purity and their minerality. 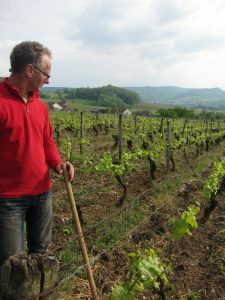 Michel is a quiet but talented vigneron who tends his vines meticulously and watches carefully over his wines as they are maturing. He likes to make his wine using the traditional techniques of the Jura. 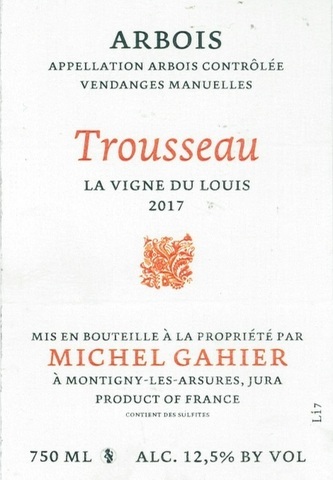 Michel tends 6 hectares of vines of which 3 hectares are given over to Trousseau and the remainder is split between Chardonnay and Savagnin. The vines for this wine are even older than those used for the La Vigne du Louis having been planted over 80 years ago. The wine is named after the lieu dit (parcel of land) where the vines grow. Here the gentle slopes are fully exposed to the sun allowing the grapes to ripen perfectly. The marl in which the vines thrive add minerality to the wine. This is a very, very good example of a Trousseau wine having the delicacy that we associate with this fragile grape but also an extraordinary depth of flavour and a complexity that is intriguing. There are tannins present giving it structure but they are not aggressive. The wine is lively on the nose, has deep, deep flavours (hints of cherry and raspberry at the front of the palate and forest floors in autumn in the middle) and it tastes alive. It has a lingering mineral aftertaste. This is a living wine! No sulphite is added. 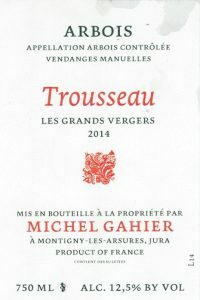 Gahier’s Trousseau “Grands Vergers” is from a parcel of low-yielding 60-70 year old vines adjacent to Puffeney’s “Berangeres” vineyard. Mineral driven and a true vin de garde, this wine is raised in old barrels and will make a superb addition to your cellar. 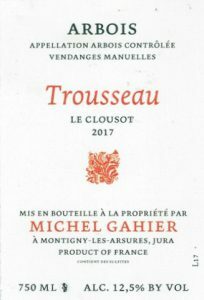 Le Clousot is a Trousseau that is lighter than the Grands Vergers, it is a paler colour but has a vibrant freshness and hints of smokiness. It is made in exactly the same way as the Grands Vergers but the fruit is sourced from the youngest vines that Michel owns. Younger vines usually produce lighter wine styles of less complexity than older vines, but wines that are pleasant drinking nevertheless. It has good structure, very good length and is quite juicy – hence is very drinkable. The ‘young’ vines are twenty years old and lie on a south west facing slope. No sulphite has been added to this wine at any time during the winemaking process or at bottling. Le Vigne du Louis is a Trousseau that is lighter than the Grands Vergers and Le Clousot, it is a paler colour but has a vibrant freshness and hints of smokiness. It is made in exactly the same way as the Grands Vergers but the fruit is sourced from younger vines. Younger vines usually produce lighter wine styles of less complexity than older vines, but wines that are pleasant drinking nevertheless. A small amount of sulphite was added to this wine when it was bottled. It has good structure, very good length and is quite juicy – hence is very drinkable. 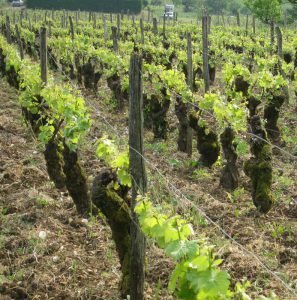 The ‘young’ vines are twenty years old and lie on a south west facing slope. This vintage you can detect a fuller, supple velvety character emerging in the wine which is very appealing. The grapes for the Les Follasses, which benefit from limestone and clay soils in the vineyard are manually harvested and sorted prior to pressing. The wine is made in the ‘ouillé’ style where the barrels are topped up during maturation so that the wine does not oxidise in the barrel. No sulphites are added to this wine at any stage. This is a fresh, lively Chardonnay that is typical of this style of wine from the Jura with just a hint of those oxidative qualities that Jura aficionados just can’t get enough of. Only 12.5% alcohol and stunning value. The Les Follasses vineyard is divided into two parts. The top block has the vines running north to south and the bottom block has the vines running east west. The grapes for this wine are also manually harvested and matured in old wood so that the wine can ‘breath’ but so that no new oak flavour dominates the wine. We drank this wine over three days and it held up beautifully right to the end. This is common with wines that have some oxidative qualities. A little sulphite was added to this wine when it was bottled. This wine has a lovely mouth feel. Only 12.5% alcohol. 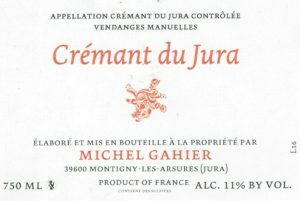 This is one of our favourite Jura wines. The grapes are sourced from the La Fauquette vineyard close to Michel’s house. 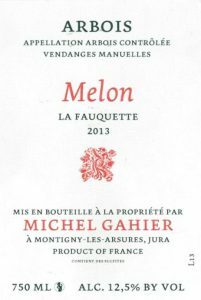 This is a ‘sous voile’ wine made from the mutant grape found only in the Jura called Melon le Queue Rouge. As the name implies, this grape variety is distinctive because the grape has a “red tail”. 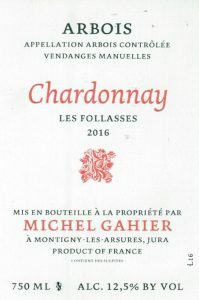 It is likely that this variety is a mutant of Chardonnay and is much beloved by Jura producers despite the difficulty in tending the vines. The barrel in which it matures is not topped up as with the other two white cuvées. Instead, as the wine evaporates through the pores of the barrel a thin veil (voile) of yeast forms on the surface of the wine and this protects the wine from excessive oxidation. The oxygen that does penetrate the veil causes it to develop an exciting nutty spiciness that is incredibly appealing. Chambers Street Wines in New York rave about this wine and call it ‘mellow, pretty, exquisitely balanced and very delicious’. It makes this wine a perfect accompaniment to the great cheeses of the region especially the famous aged Comté. This wine is now over 4 years old but is still as fresh as the day it was bottled and will last for many years to come despite having had no sulphites added at any time. It is drinking beautifully now. 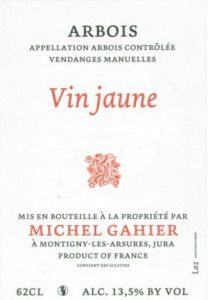 Vin Jaune is probably the rarest and most sought after wine of the Jura region. There is just not enough of it made. It takes a long time for it to be ready (by law it has to age in wooden barrels for a minimum of six years and three months). While it is aging much of the volume evaporates leaving only small quantities to bottle. The wine must be aged ‘sous voile’ so the barrels cannot be topped up. This wine has all the characteristics of a great Jura Vin Jaune. It is nutty and spicy and quite compelling to drink. The finish is incredibly long and lingering. It is a lighter style than others we have tried and hence more nuanced and more delicate. We like to call such a wine a ‘contemplative wine’ because you need to drink it slowly and think about it a lot. This is a strange appellation because it references a wine type as well as an area. This is a wine that is made from unfermented grape juice and must which has been boiled to reduce the volume by 50%. The wine is then fortified with a marc which has been made on the premises to gain an alcohol level between 16% to 22% which is required for acceptance by the appellation. The resulting wine must then be aged in old oak barrels for at least a year before being released. The wine can be red, white or rosé depending on the grapes used. This sparkling wine is made in the Champagne style, hence qualifying for the appellation of Crémant du Jura. It is a wonderful wine with great complexity which is why we love the Crémants from all regions of France outside Champagne. 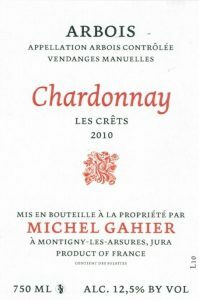 The wine is made from 100% Chardonnay, a grape that Michel has a particular affinity for. This wine has fine bubbles, some yeast, a lively fruit flavour and a good, long finish. It has an alcohol level of 11%. This wine was disgorged in May 2016 meaning that it had been resting on lees for almost two years. This is an excellent price for a sparkling wine of this quality.